Augustine Deen, a 31-year-old officer with the Sierra Leone Police Force, was on night duty at his post in Freetown, counting down the hours, when disaster struck. In the early morning of August 14, a major mudslide hit Mount Sugarloaf, which overlooks the capital, slicing it in two. The collapse killed 400 people, with hundreds more still missing, and left an estimated 3,000 homeless. Corpses floated in the floodwaters, while some families were forced to dig for the bodies of their loved ones under the rubble. Deen’s wife and six children back home in the Pentagon New Site slum on the mountain slopes survived, but his four brothers, sister-in-law and his nephew were killed. Home to a little over 1 million people, according to a 2015 census, Freetown grew at the turn of the century as citizens in rural areas fled a decade-long civil war that ended in 2002. The city was originally designed to house about 300,000 people, and it’s now struggling to meet basic needs for housing, electricity, sewage and water, said Jamie Hitchen, a policy researcher at the London-based Africa Research Institute. Homes are being built in areas identified as “at risk,” and despite the creation of an European Union-funded Freetown Development Plan in 2014, city planning has been given little priority, he added. FILE – A World Food Program tent is seen at an internally displaced persons camp in Regent, Sierra Leone, Aug. 21, 2017. Freetown, initially designed by colonial-era British administrators, has been plagued by heavy rains and flooding yearly since 2008. Its many slums and informal settlements are built high on mountain slopes, leaving tens of thousands of inhabitants vulnerable to death and displacement when the rains come. Builders have encroached into protected forest areas on the hills behind the city, causing soil erosion — a phenomenon that contributed to the August landslide. Officials at Freetown City Council said there are laws to prevent illegal construction, but these are often flouted or permits obtained through bribery. In 2014, the Sierra Leone Urban Research Center carried out an environmental assessment to map areas at risk of flooding, but the government did not act on it. 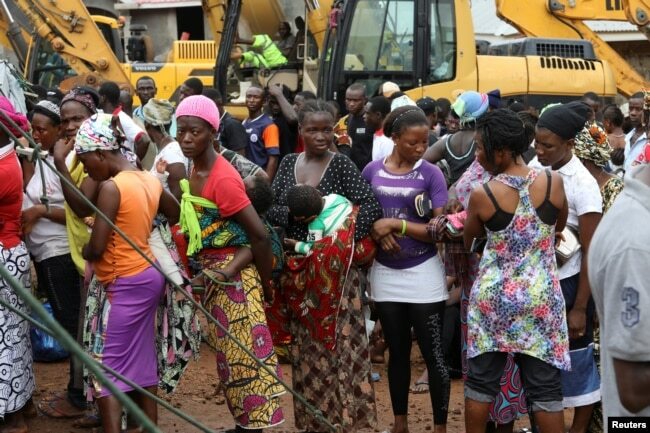 FILE – Victims of the August mudslide are gathered in a queue at an internally displaced persons camp in Regent, Sierra Leone, Aug. 21, 2017. “Over the years, many people were displaced by crises, including the … civil war, so many people escaped to the city and built houses in areas where they shouldn’t,” said Cornelius Deveaux, deputy minister of information. High levels of poverty, however, are putting slum communities at risk of disasters. In a country where GDP per capita is $1,400 and 60 percent of people live on less than $1.25 a day, according to U.N. data, having a home is judged as more important than safety. Parts of the Regent area where the August disaster happened remain at risk of further landslides and flooding, but many residents say they have nowhere else to go. “The closer to the mountain you go, the cheaper [it is] to rent houses for your family,” said Salim Bangura, 38, who lives with his wife in Congo Town slum. “Some of us don’t have electricity, but we need a roof over our head as we struggle to make ends meet,” said Bangura, who gets by peddling food and household goods. He and his neighbors know that in a pre-election year, politicians may make promises of mass housing to get them to move, but they have been offered nothing yet. “This is the only life we know,” he said. FILE – A nongovernmental organization distributes meals to victims of August mudslide at the internally displaced persons camp in Regent, Sierra Leone, Aug. 19, 2017. All eight members of Deen’s family are living in a small tent in Juba camp, alongside nearly 500 people who lost their homes in the mudslide. 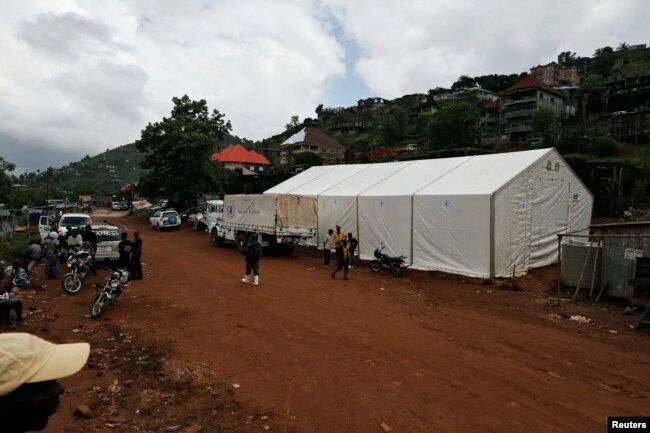 Food, clothing and medicine come mostly from relief agencies including the U.N. Population Fund (UNFPA), which has refurbished the only health center near the disaster zone. Kim Eva Dickson, UNFPA head in Sierra Leone, said it was providing women and girls with antenatal care, ultrasound scans, mother and baby kits, and personal hygiene supplies. Among disaster-hit communities living in temporary shelters, “the risks of unwanted pregnancies … sexually transmitted diseases and gender-based violence increases,” she said. The government, meanwhile, has provided counseling for the bereaved still grieving over lost relatives and possessions. Public resources were stretched thin by the 2014-16 Ebola outbreak that killed over 4,000 people in Sierra Leone. But the government is giving cash totaling about $171 to each family affected by the mudslide, with the last payment due in November. It plans to close the two formal camps in mid-November, leaving their more than 2,000 residents with a choice of taking cash payments or moving to new homes being built for them. Households that opt for cash will each get about $284 to help them rebuild their lives — enough to rent a one-bedroom apartment in downtown Freetown for a year. 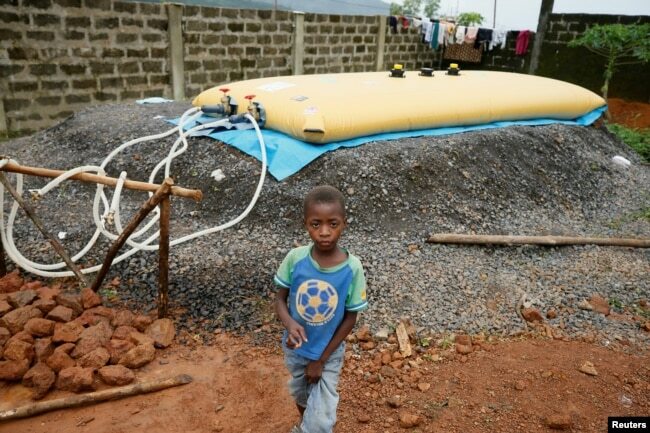 FILE – A boy walks past a water supply point at an internally displaced persons camp in Regent, Sierra Leone. Aug. 21, 2017. The government has an agreement with local companies to construct 53 houses on the outskirts of the city for displaced families, and is in talks with other investors to build more homes for survivors. This is separate from a long-term plan to create affordable housing for about 35,000 citizens in all, said Deveaux. Deen has heard the government is building free housing estates at 6 Mile on the outskirts of Freetown, but said there has been little information about the project. Previous government action has made local people wary. After floods in 2015, the government evicted 100 families living in Crab Town slum and moved them to a location about 20 kilometers (12 miles) from Freetown. But they were back in the capital a couple of months later, having rented out their new homes, said Hitchen. The new housing stock was better than in the slums, but the village lacked basic amenities, work opportunities were few and people were cut off from their community networks. “We don’t want to go to somewhere without knowing what we are getting into,” said Deen.